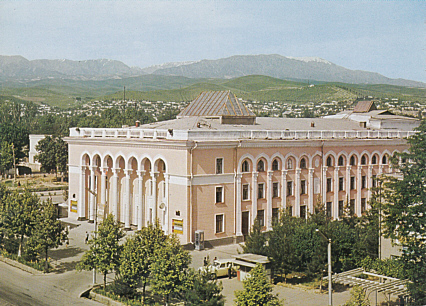 Academic Dramatic Theatre, named in honour of the Persian/Tajik poet, Abolqasem Lahouti (1887-1957). Reverse Text: "Dushanbe. Dramatichesky teatr im. A. Lakuthi. - Dushanbe. A. Lakhuti drama theatre"